Leonard Bernstein was one of the first classical composers in America to achieve both popular and critical acclaim. He was eclectic in his sources - drawing on jazz and modernism, the traditions of Jewish music and the Broadway musical - and many of Bernstein's scores are remarkably well suited to dance. He was particularly associated with Jerome Robbins, their credits together including Fancy Free and West Side Story. 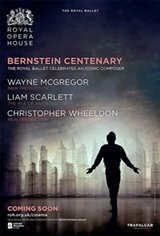 To celebrate the centenary year of the composer's birth, The Royal Ballet has united all three of its associate choreographers to celebrate the dynamic range and danceability of Bernstein's music. The programme includes two world premieres by Resident Choreographer Wayne McGregor and Artistic Associate Christopher Wheeldon, marking each artist's first foray into Bernstein.